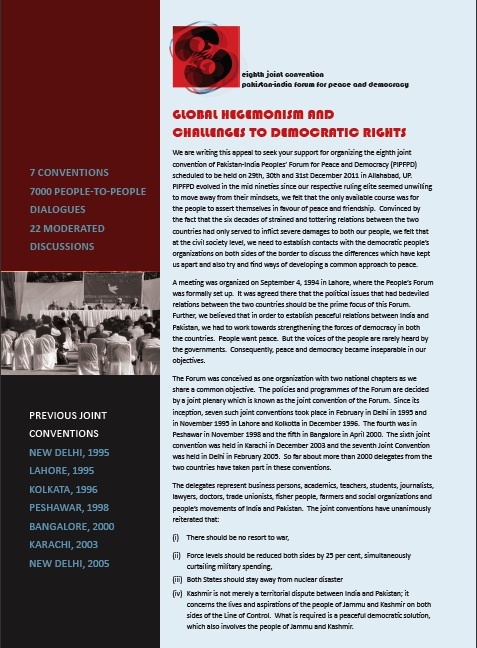 My curtain raiser on the Eighth Pakistan-India People’s Forum for Peace and Democracy (PIPFPD) Joint Convention being held in Allahabad, India, Dec 29, 2011-Jan 1, 2012 (slightly shorter version published as an op-ed in The News). When the name was being decided, the Indians insisted that Pakistan should be mentioned first, rather than the usual formulation that places India’s name first. This apparently trivial gesture typifies the PIPFPD’s cooperative spirit. The Indian government’s clearance of visas for 237 Pakistanis to attend a major peace convention in Allahabad, Dec 29, 2011 to Jan 1, 2012, is a welcome step, allowing the much-delayed Eighth Joint Convention of the Pakistan-India People’s Forum for Peace and Democracy (PIPFPD) to finally be held. The PIPFPD is the largest people-to-people organisation between the two countries, formed in 1994 by eminent intellectuals, academics and activists from both sides. Discussions at the Joint Conventions revolve around issues ranging from ‘war, de-militarization, peace and peace dividends’, to ‘Democratic solution to Kashmir problem’, ‘Democratic Governance’ and ‘Religious intolerance in India and Pakistan’. 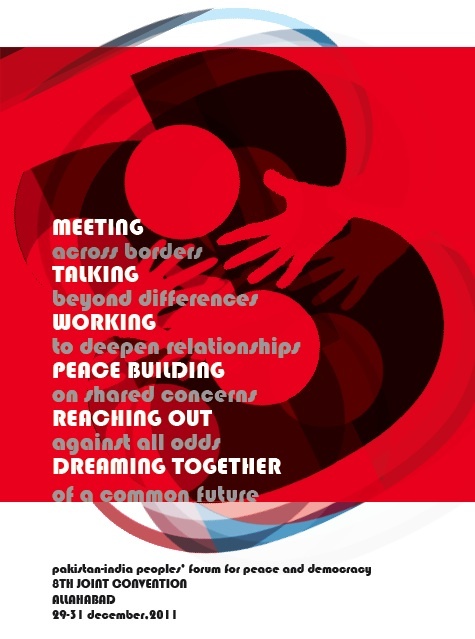 ‘Globalization and Regional co-operation’ was added at the 5th Joint Convention in 2000 at Bangalore. 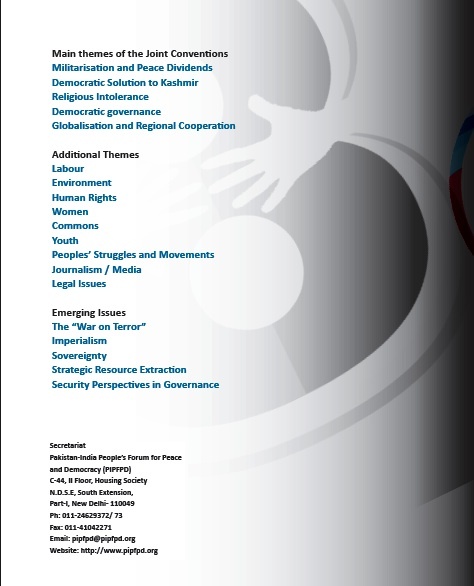 The principles laid out in the initial PIPFPD Declaration of 1994 are even more relevant today than they were then: that the “politics of confrontation between India and Pakistan has failed to achieve benefits of any kind for the people of both countries”, and that the respective governments should honour the wishes of their people who “increasingly want genuine peace and friendship”. Better relations, said the Declaration, “will help in reducing communal and ethnic tension” and “will help the South Asian region to progress economically and socially”. The Declaration urged the Governments of Pakistan and India to “agree to an unconditional no-war pact immediately” and to recognise that “a democratic solution to the Kashmir dispute is essential”. 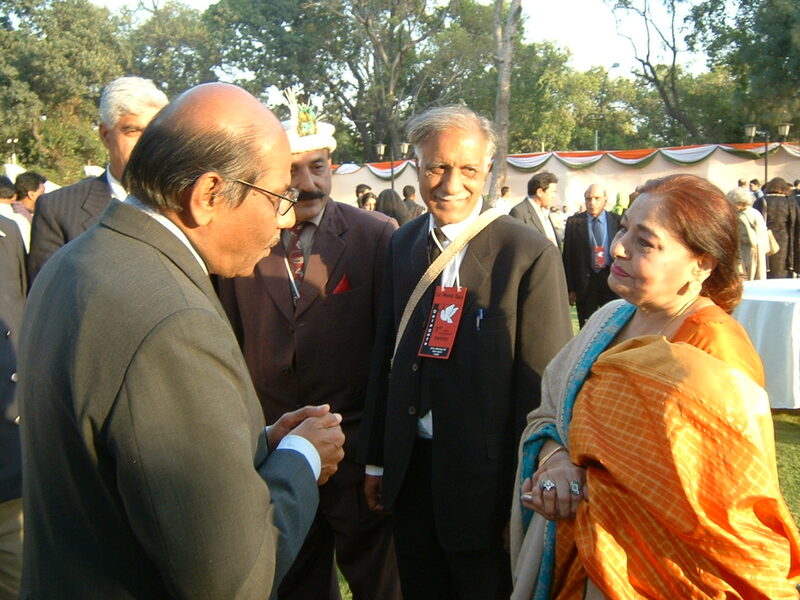 Over 200 Pakistani and Indian delegates participated in the groundbreaking First Joint Convention in New Delhi, 1995. For the first time, Indians and Pakistanis sat together to freely discuss the contentious issues of Kashmir, demilitarization, and the politics of religious intolerance. PIPFPD’s formulation about Kashmir is now part of public discourse: that Kashmir should not be viewed merely as a territorial dispute between India and Pakistan but as a matter of the lives and aspirations of the Kashmiri people, who must be involved in any discussion about their future. The seven joint Conventions held since in various cities across the region, alternating between both countries, have involved hundreds of ordinary citizens. Delegates pay for their own travel expenses, while the hosts arrange inexpensive board and lodging. These Conventions have yielded not only lasting relations between individuals but also spawned dozens of Indo-Pak organisations and meetings between different ‘sectors’ – fisherfolk, teachers, students, journalists, doctors, lawyers, labour unions, rights groups and others. It was PIPFPD’s First Joint Convention in New Delhi in 1995 that led to the first regular column by an Indian journalist in a Pakistani newspaper (The News on Sunday) since the 1960s. Today, most newspapers and TV channels in Pakistan have correspondents, stringers and resource persons in India, and vice versa. Initial delays to the Eighth Joint Convention came from Pakistan, where it was supposed to be held in Peshawar in 2007, after the Seventh Joint Convention in New Delhi in 2005. 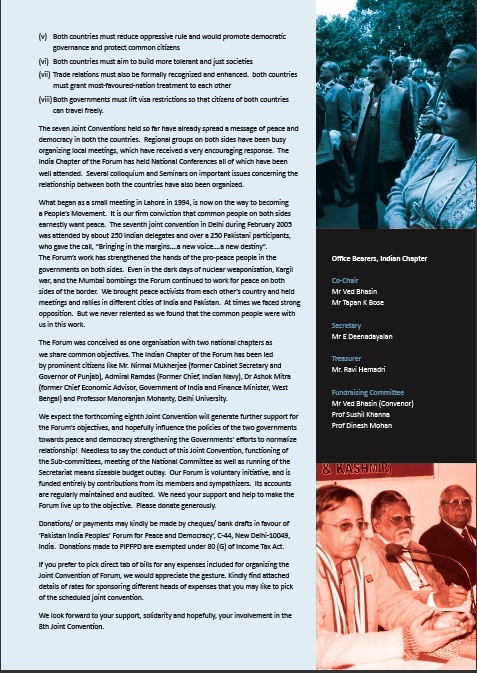 The political situation provided justifications to deny the necessary permission: escalation in the ‘war on terror’, the lawyers’ movement, the return and then the tragic assassination of Benazir Bhutto, and escalating violence in Pakistan as the new government tried to tackle the militants unambiguously. When it became clear that trying to hold the Convention in Pakistan would add to more delay, the organisers decided to move it to India. That took over a year and much negotiation. Conditions were verbally set out and apprehensions voiced about the possibility of ‘wrong speeches’ being made – not just by the Pakistanis but by Indians. However, those raising the objections were unwilling to spell out their apprehensions in writing. In the end, persistence and people pressure paid off. Several Indo-Pak events have been held over the past two years, including by Aman ki Asha. Many were initiated by Indians, contrary to the perception that “Indians don’t care about peace with Pakistan”. Significantly, some of the most inspiring initiatives have come from Mumbai, a city still reeling from the horrific attacks of Nov 26-28, 2008 that many Indians squarely blame Pakistan for. However, many Indians, including Mumbaikars, argue that all Pakistanis should not be held responsible for the actions of a few. An extraordinary expression of this spirit was the 50-kilometre long ‘human chain for peace’ formed by some 60,000 Mumbaikars on Dec 12, 2008, urging the Government of India to show restraint in dealing with Pakistan — just days after the attacks that claimed 164 lives and left over 300 wounded. This hugely impressive event was overshadowed by the jingoism amplified by the media, but the Indian government did not (for several reasons) pander to those baying for action against Pakistan. Earlier this year, students from Mumbai came up with a pioneering initiative they called ‘Ummeed-e-Milaap’ (hope for unity), a platform for Indian and Pakistani students to connect, in over 30 colleges in Mumbai, Lahore and Karachi. Last month, a 22-member delegation of journalists from The Press Club of Mumbai travelled to Pakistan to connect with colleagues in Karachi and Hyderabad, culminating in a joint Declaration of Cooperation. The world is changing. The old paradigms and policies based on paranoia and hatred must give way to a realisation that it is only with cooperation with each other that India that Pakistan can fulfil their respective potentials. The Seventh Joint Convention articulated some visionary steps that both governments can take towards this end (see www.pipfpd.org). The Allahabad Convention will take forward these demands, foremost among which is easing the current restrictive visa regime. We have seen what happens when thousands of cricket fans are given visas to attend matches across the border: nothing, except for goodwill and a reaffirmation that the people are ready for good relations and personal contacts. As the Allahabad Convention gets under way, do our governments have the political will and vision to follow the people to peace or will they remain mired in outdated security state paradigms? ‘horrific attacks of Nov 26-28, 2008 that many Indians squarely blame Pakistan for’ Whom should we blame ? Should we like pakistanis cook up conspiracy theories which involve Mossad and the CIA ? Get real. Abdul Malik, it would be sensible if we understood the basic fact that while right wing terrorism does prevail in Pakistan, they do not represent the nation as a whole. In fact, they are the few rotten apples whom we Indians extrapolate to represent the whole nation. Yes, there is LeT, TTP and even the DPC. So what? We know that they do more damage to their own country day in and day out, and the majority population detests them as any normal humans would. We too have right wing factions in India. So does that make you and me right wing too? Why blame an entire nation for the cowardly acts of a few mala fide morons?